As the summer heat comes to the highest peak of a year, the 7-inch tablet market becomes hotter than ever before with the official debut of Google’s new Nexus 7 tablet. 2mm thinner and 6mm narrower than the previous Nexus 7, the rebooted tablet comes with 7-inch HD resolution 1920*1200 display, Android 4.3 mobile OS, long battery life and rock-bottom price, which will have its rivals sweating. For video buffs, 9-hour full HD 1080P video playback on this 7-inch tablet would deserve their applause most. However, the sluggish network speed or network interruption may easily drive you crazy when you are watching wonderful YouTube video on this new Nexus 7 tablet. Worse still, the format incompatibility remains a hot potato since the downloaded FLV YouTube video cannot be played on the new Nexus 7 which is only compatible with video formats like H.264, MPEG4, MOV, M4V, etc. So, if you want to play YouTube video on Google new Nexus 7 tablet smoothly without worrying about the network limitation, it is suggested to convert YouTube to Google new Nexus 7 compatible format first for latter playback. To get the YouTube video to new Nexus 7 conversion done, a professional new Nexus 7 video converter is inevitable. 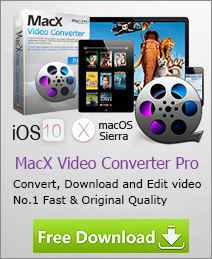 Fortunately, MacX Video Converter Pro has been developed as the best new Nexus 7 video converter. Acting as an excellent YouTube video downloader and a preeminent video converter for new Nexus 7, this program can help you download and convert YouTube video to Google new Nexus 7 with 5X faster speed. Thanks to the visualized interface and High Quality Engine, the YouTube to new Nexus 7 conversion task can be finished without any hiccup or any video quality loss. Moreover, besides converting YouTube video to Google new Nexus 7, this new Nexus 7 video converter can also convert other videos including AIV, MP4, MOV, MKV, M2TS and more to new Nexus 7, enabling you to watch all types of videos on this fabulous 7-inch Google Nexus tablet. Before converting YouTube video to Google new Nexus 7, you have to download, install and run this new Nexus 7 video converter on Mac first. For Windows users, you can head over to the Windows-based video converter to finish YouTube video to new Nexus 7 conversion on PC. To play YouTube video on Google new Nexus 7, simply select new Nexus 7 recognized format like H.264 or MPEG-4 as the output format. 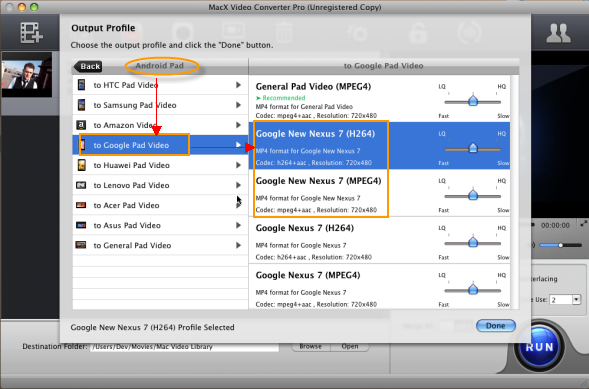 You can hit Android Pad -> to Google Pad Video -> Google New Nexus 7 and choose the specific video format as you like. Click "RUN" button to start to convert YouTube to Google new Nexus 7 on Mac. Once the conversion is done, connect your Google tab with your computer via USB to transfer the converted YouTube file into your tablet. Then you can play YouTube video on Google new Nexus 7 anywhere anytime. Packed with 420+ preset profiles, this new Nexus 7 video converter works perfectly to convert any video to almost all iOS Microsoft and Android mobiles and tablets. For example, you can transcode video to iPhone (Xs/Xs Max), iPad Mini, iPod Touch as well as transfer HD video to WP8, Surface, Galaxy S9, Kindle Fire, PSP, etc for free watching.